Prefab Modular Tanning Rooms Installation & Sales Nationwide. One of the fastest growing industries in the modern world is that of beauty and wellness, and this has created a large number of opportunities for businesses who want to take advantage of the growth in the market for a wide variety of different products. One of the most popular areas for new businesses and existing salons alike is that of indoor tanning. There is lots of demand from people of all ages, both men and women, who want to be able to enjoy a great tan all year round, and being able to provide them with the environment where they can achieve that goal is a vital one. Modular tanning rooms such as those available from Easy Rack offer you the ability to install a large area within an existing building that can be used to set up a large dedicated area of solaria. Modular tanning rooms allow you to quickly convert space in a straightforward and efficient way without any of the drawbacks that you would normally associate with construction work. 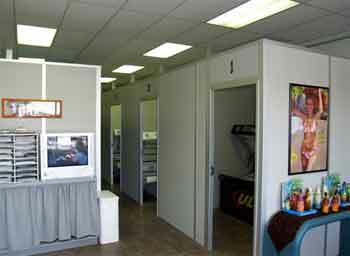 Tanning rooms typically need to be a relatively small space, and simply contain a sun bed and changing facilities. 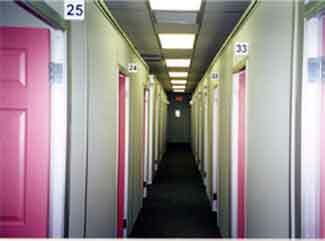 This means that almost any building can be converted relatively simply, and provide adequate facilities for a number of sun beds to be installed, each with their own unique space within the building. The actual construction work required to install modular tanning rooms is minimized through the fact that most of the actual work on preparing the walls and other components is carried out at the factory, and the various elements of the rooms can simply be delivered ready for installation. The actual process of construction using modular components is much cleaner and faster than alternative methods, while the ability for you to completely specify areas such as the design, size, and décor of the rooms in advance of their delivery. Modular tanning rooms will allow you to create a number of small rooms that offer users privacy when they are using the sun beds, as well as giving them the space and safety that they want to store their clothes and other items. They allow you to as the owner of the business to make the best possible use of the space available to you, and offer a much better solution to creating individual booths than a conventional building project would. No matter how many modular tanning rooms you install, the process is relatively simple, and can be carried out by a team of professionals relatively quickly when compared to alternative methods of building. As the indoor tanning industry grows, with more and more people choosing to use sun beds in order to ensure that they have a healthy color all year round, there is enormous potential for growth for your business, and this is where modular construction can really assist your business. The space that you have can grow with you and you can even take the modular tanning rooms to a new location and install them there along with more rooms that can simply be added to the existing number thanks to the compatibility of the various components. Easy Rack carries a wide variety of material handling equipment, used pallet racks, and modular buildings installed nationwide. If you can not find what you are looking for call us toll free at 1-888-776-3720 and we will find it for you. Our home office is located in Houston, Texas with strategic partners located in all 50 States including New York, Los Angeles CA, Miami, FL. Chicago, IL. Denver CO., Dallas TX, San Antonio, TX. and Austin, TX.